Who doesn’t love a creepy wedding photo on the cover of a book? 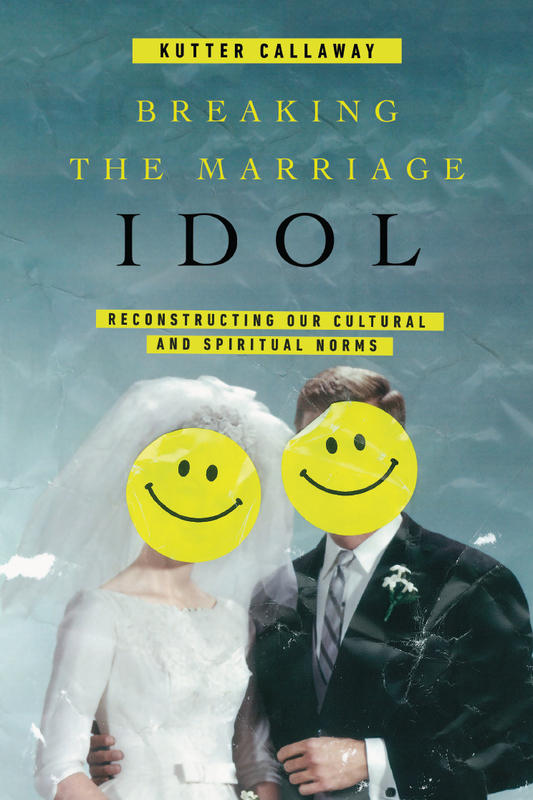 In Breaking the Marriage Idol, evangelical professor Kutter Callaway challenges American Christians to develop a new "theological anthropology," or vision of who we are as people and what a good life looks like. Tearing down the stories of Disney, pop music, and reality TV, he also criticize the religious vision of married life as the standard for all grownups. These tales of romance as fulfillment, he says, don't help folks deal with unrealized sexual desire (before, in, or after marriage), comprehend the Bible's many perspectives on marriage clearly, or support community members who never pair bond. Instead, he urges us to establish rituals celebrating friendship and adult adoption, making other relationships also deep and sacred. I was most amused when he suggested we reduce the divorce rate by encouraging more Christians to stay single (!). Very contrary to Christian culture, but if they're not sure they want to marry, why are we pushing them into it? Callaway's influences are clear, from Catholic theologians who frame sexuality as pervading all of life, to James K.A. Smith on our desires as formed through imagination and ritual, to Wesley Hill and Christena Cleveland on the holistic single Christian life.